Residents complained of a foul odor coming from a dumpster in a Philadelphia neighborhood. Upon inspection, housing authority police discovered skeletal human remains inside a suitcase left in the said dumpster. The gruesome discovery was made on Tuesday afternoon at 4:15 p.m.
One of the residents said: “The suitcase was in there and you could smell it. The first police officer came and opened it and all you could see was maggots." Philadelphia Police Lt. John Walker said what they discovered appears to be the partially decomposed body of a black woman and the body appears to be intact. Walker said: "It appears to be a female. I'm not sure of the age at this point. We're not sure when it was placed there, but we do know the trash from those two dumpsters was picked up from the housing sanitation department." Police said it's possible that the suitcase was purposely left for Monday's trash pickup schedule. Investigators said the body appears to be partially decomposed. Police cannot yet determine how long she has been dead. The dead woman had clothes on. What the officials find extra disturbing is the fact that on late Tuesday afternoon Tuesday afternoon both kids and adults were keenly watching as detectives and the crime scene unit combed the parking lot. 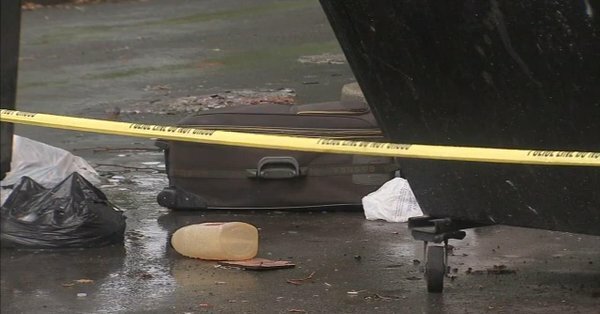 Officials echo the concerns of residents that their kids could have encountered the suitcase or played with it and be shocked by what they could see inside. Some residents feel the body was dumped in their community illegally but the broad daylight crime has them feeling quite rattled. The medical examiner arrived and removed the suitcase with the body still inside. The medical examiner is working to identify the body and determine the exact cause of death. terrible, no respect for life and dignity huh. and safety of others as well. Iiiiiin West Philadelphia skeletal remains were found in a housing authority unarranged, maggots all crawling, something putrid with ooze, started stinking up the whole neighborhood.